Milagrow HumanTech has today launched a new tablet in India called the TabTop 7.4 which is said to be the slimmest 7 inch tablet in India at 6.5mm. The TabTop 7.4 runs on Android v4.0.3 (Ice Cream Sandwich) and will be updated from time to time. It also offers 4G/3G and 2G compatibility via external dongle, Wi-Fi, LAN, VPN, & Ethernet and you can also plug in your external hard disk drive of up to 500GB. The tablet offers a 4:3 aspect ratio instead of the traditional 16:9 ratio on 7 inch tablets. It comes pre-loaded with various apps in various categories including Productivity, Utility, Networking, Entertainment and Medical Folders. There are also specially pre-installed unique applications for Sales Professionals, for Doctors – Radiology Viewer, Hearing Test, and Virtual Plastic Surgery and for Architects – Auto Desk. A 1.2 GHz processor runs the tablet with 512MB of RAM and a Dual Mali 400 MP graphics processor. The 7 inch display offers an 800×600 resolution, and the tablet is said to support full HD video formats. Two versions of the tablet are available including a 4GB variant for Rs. 10,990 and a 16GB variant for Rs. 13,990. 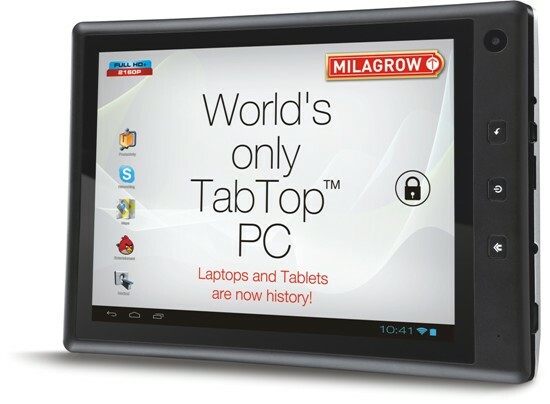 For more on specs and details of the tablet, visit the Milagrow website here.